We’d taken a trip as a family to South Africa earlier this year and savoured the delights of the beautiful food and wine whilst we were there, so a week or so after returning to the UK, I was wanting to relive that food experience. Churchgate had some boerewors on their list so, sorry Jason, we just had to see if they met our expectations! Boerewors is a complex sausage we are informed. The mix contains 90%+ beef (80:20) that’s meat to beef fat, quite an alarming amount of ground coriander, plus cloves, nutmeg, black pepper, vinegar and salt…the quantities of each ingredient used can be varied but no doubt through trial and inevitable error, that is the only way to get it right. Churchgate boerewors (I hasten to add) in our opinion, has it spot on! 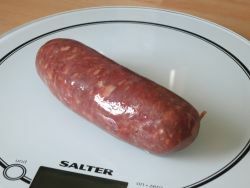 A substantially solid beefy sausage with a really decent bite and a firm texture. The flavour for some of the troops here may present the need for an acquired taste, but for me…just give me another one! Hot from the pan or eaten cold later, it makes no odds! We did try them grilled, but pan fried really slowly is best, and perhaps leaving them just under done so that they finish off with their internal residual heat whilst dishing up, does make sure that they retain succulence and don’t dry out. As they’re all beef (OK, the skins are hog), you can even eat them medium rare if you really want! 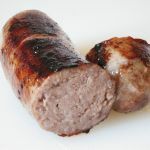 You may have gathered from our review that we really rate the flavour authenticity and presentation of Churchgate’s boerewors, and in talking to Jason at Churchgate, we understand his South African born customers do too! Right, more boerewors and a glass of Kanonkop Pinotage I think! 125x30mm before cooking, 115x30mm after. 86g before cooking, 73g after. That's a shrinkage of 8% & weight loss of approx 15%.